As I no longer have access to the private discussion and collaboration spaces hosted by the Recurse Center, published here is one page from their internal Wiki that I authored. It is presented in its original Markdown format. First off, we're thrilled you've chosen to participate in a batch at the Recurse Center! Coming to New York City can feel daunting for many people, but it's likely to feel even scarier if one cannot dedicate a large budget for such a trip. This page is devoted to **resources and suggestions that we hope will help people with little to no money thrive in New York City**. Finding shelter in NYC is rough. The housing market here is one of the most competitive in the world. The Recurse Center staff know this and have helpfully provided a [Housing forum](https://community.recurse.com/f/housing/12) on RC's internal bulletin board system, *Community*. If you don't have access to that, you will soon. Nevertheless, be prepared for the fact that **most people's idea of "alternative" housing is probably not your idea of "alternative. "** The Housing forum on Community is primarily a place to find roommates or relatively inexpensive sublets; it's likely that most of these will be well beyond your budget. "Cheap" housing in NYC ranges from $600 a month and higher. Most AirBnB prices within reasonable distance to Manhattan are even worse. **Couch-surfing, house- or pet-sitting, and stealth urban camping are your most realistic options. ** The good news is that these are relatively plentiful. A stream on Zulip (RC's internal chat system; again, you'll get access to this soon if you don't already have it) for posting couchsurfing requests! One of the earliest and largest travel hospitality social networks on the Web. Make an account, if you haven't already, it's free. Like CouchSurfing, above, but created specifically for bicyclists. If you're a cyclist, even if you have no plans to cycle through NYC, consider making an account here. It will be easier to find a host given that you can represent yourself as part of a community-of-interest. Many residents of New York City travel frequently, especially Recurse Center alumni. This means you will have more opportunities to house- and/or pet-sit for "friends of friends" than you might otherwise have. It's likely that **food in New York City is an order of magnitude more expensive** than you're used to. **DO. NOT. UNDERESTIMATE. THIS. ** This applies to supermarkets, bodegas, and groceries, as well as cafés, restaurants, and even a number of fast food chains. If you do have a budget for food, triple it if you can. In addition to the increased cost of groceries, be mindful of the fact that you are likely to have less time/emotional/mental resources on which to spend preparing food yourself, due to the constant bustling atmosphere of events both in the city and at Recurse Center itself. This means you are likely to eat take-out/delivery more often than you might otherwise, despite your best efforts. In case you do find the time to cook, [Good and Cheap](https://cookbooks.leannebrown.com/good-and-cheap.pdf) is a nice guide to eating well on a budget in the US. **Skipping/dumpster diving** can be trickier due to the density of the population and the longer hours of most establishments. This is especially true if you are accustomed to a more suburban diving setting. Skipping is also illegal here and there is a near-constant presence of police on patrol in most parts of lower Manhattan. (The outer boroughs are more varied in terms of their dumpster diving options and police presence.) That said, any trash bin or bag left near the street (as opposed to immediately next to a building or behind a fenced enclosure on the sidewalk) are [considered public domain](https://freegan.info/what-is-a-freegan/freegan-practices/urban-foraging/diving-and-the-law/) and can be taken. Of possible use is the [FallingFruit.org/dumpsters](http://fallingfruit.org/dumpsters) map, and the [Freegan.Info Manhattan](https://freegan.info/freegan-directories/dumpster-directory/manhattan/) and [Brooklyn Dumpster Directories](https://freegan.info/freegan-directories/dumpster-directory/brooklyn/). If you are on **SNAP/EBT/Food Stamps**, you will be able to use them, even if you are from out-of-State. However, **many small shops do not accept EBT**. This includes corner bodegas, delis, and combination grocery store/eateries. Even fewer shops in the immediate vicinity of the Recurse Center's 455 Broadway location accept EBT, due to the classism^H^H^H dynamics of the SoHo and surrounding neighborhoods. Use the [SNAP Retailer Locator](http://www.fns.usda.gov/snap/retailerlocator) provided by the United States Department of Agriculture to locate nearby grocers where you can pay for food with your EBT card. **Food banks/[food pantries/soup kitchens](http://www1.nyc.gov/nyc-resources/service/1083/find-a-food-pantry-or-soup-kitchen)** may also be an option for acquiring food, especially if you have access to a kitchen at your place of shelter. New York City's municipal government maintains [a directory of food pantries searchable by location](http://www1.nyc.gov/apps/311utils/providerInformation.htm?serviceId=1083). There are also informal networks of food donations that operate like food pantries; attend some [§ Free food events](#free-food-events) to start making relationships with these groups. **The Recurse Center [[kitchen]] does not have a stove,** but there is a microwave and a small toaster oven. This means you will be unable to prepare most hot foods in the space itself, but you will be able to reheat leftovers or toast sandwiches easily. Especially for winter batches, consider cooking soups and stews at your place of shelter (if you have one—see the [#Shelter](#shelter) section for advice, tips, and warnings regarding surviving in NYC while unsheltered) and reheating them for lunch or dinner at RC. Moreover, many people find themselves wanting to arrive early and/or stay late at the Recurse Center's open-space office, and doing this means you will have even less time to actually cook food for which you need a stove. Recursers are generally open to participate in **informal group food preparation** events, such as [Abstract Salad Factory Friday](https://recurse.zulipchat.com/#narrow/stream/food/topic/Abstract.20Salad.20Factory.20Friday!) (a sort of less manipulative salad version of [stone soup](https://en.wikipedia.org/wiki/Stone_Soup) style cooking) in order to promote healthy eating and lower one another's food costs, as it's often much cheaper to prepare food for a group of people together than to do so for one. Get in on these if they're happening during your batch. If not, be bold and revive these traditions! You'll be thanked for doing so. Regular cheese slice is $1. "Lunch special" is $2.75 and includes two cheese slices and a can of Pepsi. It's pretty bland, but it's cheap. Buns. You can get a big bun and a small bun in $2. I usually take a big bun and a roasted pork bun and they are more than sufficient for me. Fúzhōu _miànshí_ 麵食 [dough-based foods]. Most soups under $5; dumplings fried 5/$1.50, in soup 8/$3 and up; diverse southern-style buns. Menu visible [here](https://s3-media3.fl.yelpcdn.com/bphoto/PuOe7xiFy31qVh7lP69gjA/o.jpg). Good preparations of some unusual Fúzhōu standards like "Fuzhou Meat Ball Noodle Soup" (_yànwán tāngmiàn_ 燕丸湯麵; the skins of the "meat balls" are made of thin-pounded pork, not wheat), noodles in peanut-butter sauce ("Stir Noodle", _bànmiàn_ 拌面), tiny but strongly flavored wontons in soup ("Fuzhou Wonton Soup" _biǎnròu_ 扁肉). * [Jubilee Marketplace](https://maps.google.com/?cid=13119853229355687346) sells egg and cheese breakfast bagel sandwiches for $3.75. 4 dumplings will set you back $1.75, but you usually need at least 8 to make a meal, bringing your total to $3.50. They're all great. Get what you want. Slices are $2 here, good for a snack or a small lunch. Drinks are overpriced; bring your own water bottle. Cheaper than Vanessa's, not as inviting, but also arguably tastier, steamed dumplings here cost $2 for 6, $3 for 10. If you eat a lot, this might be a better option. A common combo here is 10 dumplings + wheat noodles with peanut butter sauce for $3 + $2. $3.50 for a bunch of greasy chicken/pork and rice/noodles. Should fill you up quite a bit, and if you spend a bit more you can get a larger portion which should last a couple of days if not more. Cash only. Very similar food and price to Wah Fung ($3.50 - 4ish). But you can also buy sugary pastries here and the customer line moves more quickly than Wah Fung at peak times. Cash only. Standard Chinese restaurant and a bit far from RC (there's probably similar places closer), but I know this place very well. $4-5 should get you a very filling bowl of noodles and pork/chicken or a lot of fried rice. Cash only. Large portions of very cheap and tasty curries. Vegetarian. These venues range above $5 but tend to provide more sizeable portions. You may be able to stretch one purchase across two meals. * The McDonald's nearby has Small, Medium, and Large coffee for $1 (all sizes cost the same). It's passable/decent. * There is a coffee cart in the morning near [the Canal Street [A], [C], [E] station](https://www.google.com/maps/place/Canal+St/@40.7207122,-73.9993768,16z/data=!4m5!3m4!1s0x89c2598adc3342c9:0x4e7d4c005c794a91!8m2!3d40.7208241!4d-74.0052286) with coffee and pastries for ~$1-$1.50 each. Getting around New York City can be confusing at first, but is remarkably easy and fast when compared to other large cities in the United States. Depending on where in the city you're staying, however, getting around can take up a lot of time in your day. **Walking, although not the fastest, is one of the cheapest ways of getting around! ** It's also safe, and healthy, of course! The Recurse Center is located in downtown Manhattan (in the "SoHo" neighborhood), but the city itself stretches many miles North, East, and South (with the Hudson River to the West), so unless one is crashing nearby, this walk can get pretty long. Prepare for a march and wear good shoes if you have them! See also the [#Privacy](#privacy) section advice on dealing with NYC's incredibly hectic sidewalks, which can be overwhelming and stressful if you're unused to them. The [New York City Metropolitan Transit Authority](http://www.mta.info/) (the NYC MTA, or just MTA, for short) is a single municipal agency that runs all of the city's public buses and trains. New York City calls its trains "the Subway," even when the trains are above-ground, so look for signs that call out "Subway" if you're relying on analogue navigation. You might also hear people refer to the trains as "the Metro," but this is usually a pretty good sign that they are out-of-towners. **Cash cannot be used to purchase fares when entering buses or train stations. ** The only way to pay for these rides is to acquire a MetroCard from specially-marked MetroCard vending machines in Subway stations. MetroCard vending machines, however, do take cash. They also accept credit and some debit cards. See the [[Advice for foreigners coming to NY]] page for cautions and advice on getting a card that will work in NYC. **Each bus and train ride costs $2.75 per trip if purchased ahead of time, or $3.00 for a single-ride pass, and this will add up fast. ** Thankfully, you can buy "unlimited ride" MetroCards that let you hop on and off as many buses or trains as you wish until the card expires. These are available in 7-day or 30-day varieties. If you have a budget for transportation and are not staying within walking distance to the Recurse Center, *seriously consider purchasing one of these unlimited ride cards,* as they increasingly become more valuable the more frequently you use public transit services. Another benefit of these cards is that they are fixed-rate, so they may be easier to budget for. See [the NYC MTA's fares page](http://web.mta.info/nyct/fare/FaresatAGlance.htm) for the most up-to-date information about public transit fare costs. **Do not trash MetroCards you have purchased, as each physical card costs $1 on top of fare costs to acquire. ** Keep your old cards and reuse them. You can refill MetroCards by adding money to them or by extending their expiration dates for unlimited ride varieties. Sometimes people will ask for a spare "swipe" from those with monthly passes. This is *illegal*, and can lead to fines or court summons if you're caught by a transit cop or MTA employee; *even asking for a spare swipe* can get you into trouble. 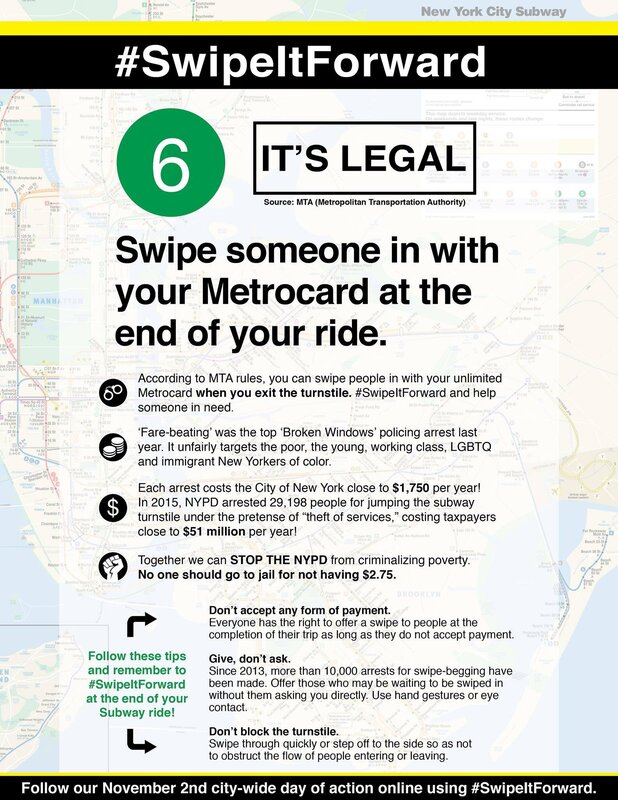 However, if you have an unlimited ride MetroCard, [it is *legal* to swipe someone else in](https://web.archive.org/web/20160803160753/http://web.mta.info/metrocard/termsunltd.htm). It is possible (and illegal) to skip the fare and jump the turnstile or enter through the emergency exit doors by tailgating through one before it closes. Be warned, this is considered Fare Evasion and could get you fined $100, and even jail time. Surveillance in NYC Subway stations (via cameras, random police patrols, and dedicated MTA security staff) is also *extremely aggressive* in comparison to many other places you may be used to, so consider these risks before making a decision. New York City's public/mass transit system is *exceptionally* dense. If this is your first time in NYC, pay special attention to what bus or train you're getting on, regardless of the stop you're waiting at. A sizeable percentage of bus stops and train stations in NYC are transfer points across different routes. This means that taking the wrong route can easily send you in the wrong direction. This is double true because NYC's public transportation network serves far and wide in New York; there's almost no part of the city the public transit options don't reach, so you can accidentally find yourself very far afield of your intended destination if you're not careful. The cross-State public transit system that connects New York City to New Jersey is called the PATH. You can pay with a MetroCard (same as the NYC subway), as long as it is not an unlimited MetroCard. The [price per trip is $2.75](http://www.panynj.gov/path/fares.html) in the PATH (same as the Subway), but they are separate systems so you have to pay again when switching from PATH to subway or vice versa. **If you're staying in Jersey City** and taking the PATH on a daily basis, it makes sense to get a PATH-specific SmartLink card, which is slightly cheaper per trip than paying with a MetroCard. Once obtained (along with a helmet and lock, or two locks), a bicycle can be a very inexpensive way to move about the city. There are [bike paths](http://www.nycbikemaps.com/maps/nyc-bike-map/) for getting nearly anywhere, many of which are relatively safe (considering the hectic mess that is New York traffic). To avoid the worst of the road, it's recommended to ride during off hours, before 8 am or after 7 pm. It's useful to note that one can take a bike on the subway at any given time, in a pinch. For fixing bikes there are a few different co-ops and community workshops [around](http://times-up.org/index.php?page=bike-co-op/) the [city](http://bikecoop.nyc/) (often with a politically oriented vibe) which will help supply tools and expertise for maintaining a working transportation machine. >  TK-TODO: This section could use some tender lovin' care. Just a braindump for now. Mayday Space in Brooklyn (~30min on the [J] or [M] trains from the Recurse Center) hosts communal dinners each Monday. Arrive at 5:30pm to help cook, and stay for the meal you helped prepare. Invitations are often posted on [Mayday Space's Facebook page](https://www.facebook.com/MaydaySpace/), too. * If you're at RC during the summer months, check out [Shakespeare in the Park](http://publictheater.org/en/Free-Shakespeare-in-the-Park/)! You have to enter a ticket lottery or wait on line in Central Park for a long time, but the shows are great. * [Jalopy Theater](https://www.jalopy.biz/) in Red Hook has great free* live music shows (most of the acts play some kind of wonderful, weird, folk music) every Wednesday night starting at 9 pm. They also sell drinks at the venue, which are cheaper than usual NYC prices (beers are about $4 each). *They do pass a donation basket around at the end of each act. * [November Project](https://www.strava.com/clubs/november-project-nyc-119741) Free fitness group that meets in the early mornings in a few different spots around NYC. Additionally, [The Skint's list of free fitness classes](https://theskint.com/free-fitness-classes/) is a well-maintained resource, as well. * [The LGBT Center's online calendar](https://gaycenter.org/calendar) has a dizzying assortment of free or low-cost events relating to [QUILTBAG](https://en.wiktionary.org/wiki/QUILTBAG)+ issues. Be mindful that some events on this calendar are intended to be safer spaces; you should contact the listed organizer before RSVP'ing to a given event if you are interested in it but unsure if the event is open to you. * [Anarchism.NYC](http://anarchism.nyc/) is a simple calendar aggregator that lists numerous "Anarchist-ish events" from several different sources. As one might expect, nearly every event on this calendar has a certain political orientation and runs a gamut of topics from discussion groups to social justice organizing and beyond. * [/r/freebies](https://reddit.com/r/freebies) and [/r/efreebies](https://reddit.com/r/efreebies) have a ton of free stuff. /r/freebies, in particular, sometimes has free food, transportation, or groceries. * [New York City Freecycle](https://trashnothing.com/new-york-city-freecycle) is a literal cyber bazaar where you can find an incredible miscellany of items in various conditions, all totally free. >  TK-TODO: EDITOR'S NOTE: This section might benefit from a different way of being organized, but it's small enough that this works for now. If you feel this is growing too large or like it's becoming a "miscellaneous" section, consider taking a moment to break it apart into more topical subsections. * you can get the [Github Student Developer Pack](https://education.github.com/pack) which includes free hosting, private repos, free domains and other things. * [Amazon Prime](https://www.amazon.com/gp/student/signup/info) has a free 6 month trial for students, which includes two-day shipping, music and legal movie streaming. Having space and time to oneself can be difficult to find in New York City, and this is especially true if one is not wealthy. (For the inverse situation, see the [#Socializing](#socializing) section.) Even a simple walk down a New York City sidewalk can be a stressful experience requiring you to navigate a gauntlet of obstacles: other people, cars, loud noises, bright lights, and many other objects moving at various speeds. For those of us who have spent a significant time by ourselves or in otherwise secluded environments, this constant stimulus and extreme proximity to other humans can feel particularly overwhelming. **The Recurse Center's 455 Broadway location is very sparsely filled on Sundays,** making it a good place to come if you're seeking a reprieve from the city. While technically open to all RC community members, it's generally near-empty for most of each Sunday. In contrast, Saturdays tend to be much busier. There is a constant, much louder hum of activity on weekdays as well as weeknights. If you have nowhere else to turn, there are some other tricks to finding a quiet place to think, write, work, or sleep in New York City. For example, **many of [Columbia University's Morningside Heights on-campus classroom buildings (PDF)](https://web.archive.org/web/20161009182725/http://www.columbia.edu/files/columbia/content/morningsidemap_2015aug.pdf) are usually empty and unlocked during the day**. You can simply walk into the building, find an empty lecture room, and read a book or work on your laptop. This is even easier if you can pass as a college student. You may be asked to move from one room to another if a class enters, and you should probably leave at night as the buildings are swept by security guards before being locked. Unlike most NYC cafés, however, you will never be asked to leave for not making a purchase. These buildings also provide some of the cleanest (pseudo-)"public" restrooms in the city. On the other hand, there is no free Wi-Fi (for the general public) on Columbia University's campus. Another way to find peace and quiet, particularly outside of Manhattan, is to **climb the fire escape of a short building**. These often go to rooftops, which are typically empty, especially at night. You can even spend the night here if you need to, and have brought your sleeping pad and bag along. Do check the weather forecast for rain over the evening if you plan to spend the night, though. You can also **enter one of NYC's famously large parks and take a path slightly-less-traveled into the greenery**. Each borough has at least one of these big public parks, and they are open (or at least easy to get into) even at night. Central Park is the canonical example, but take a [look at a Google Maps/Earth satellite view](https://www.google.com/maps/place/New+York,+NY/@40.7058254,-74.1180872,49719m/data=!3m1!1e3!4m5!3m4!1s0x89c24fa5d33f083b:0xc80b8f06e177fe62!8m2!3d40.7127837!4d-74.0059413) to get a feel for more in the outer boroughs. Find a side path leading away from cement and you'll soon find some peace and quiet, at least for a few hours if not a whole night. A word of caution, though: [NYC Parks have official curfews](https://www.nycgovparks.org/rules/section-1-03), and if a cop decides to hassle you, they could slap you with a ~$100 ticket if you're in a park after 1 A.M.